How's the foetus during week 38? Your baby is about 49 - 50cm in length and weighs about 3kg. 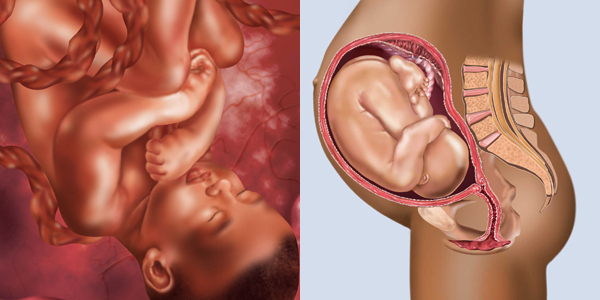 Your baby's first bowel movement (meconium) has formed in her intestines. Her position will probably remain the same until the birth. All organs - except the lungs - are fully functional. The baby is covered in vernix, a fatty substance covering the skin. You may show signs of false labour - irregular contractions which may be felt in various parts of your body (back, lower abdomen, pelvis). To make things easier for you after the birth, fill your freezer with pre-cooked meals. If your baby is lying in a breech position, discuss the implications with your doctor, as you will probably need to have a Caesarean. Your baby is fully developed and can do everything a newborn is expected to, though still gaining fat and adding connections between the neurons in her brain. By full term your little one's lungs will be mature enough to breathe air, his brain cells will be highly organised and he will have excellent hearing. His vision isn't great, but is developed enough to focus on your face the first time that you breastfeed him. You may be feeling an intense urge to "nest" lately, eager to arrange everything from your baby's nursery to the contents of your fridge. While this is Mother Nature's way of kicking your maternal instincts into high gear, try to resist expending energy on redecorating or cleaning - you'll need all your strength for labour and delivery. Even if you are counting on giving birth naturally, you should still anticipate the possibility of having a Caesarean so that you are mentally and physically prepared if it happens. About two in three babies in the private sector are born via C-section and not all of them are elective. Whether your C-section is scheduled or required at the last moment, knowing how to prepare for and "personalise" it can make the surgery less traumatic emotionally and physically and help to speed recovery. Many women worry that surgery will require them to be separated from their newborn. Yet, unless the baby or mother needs immediate medical treatment, most hospitals will accommodate parents' expressed wishes for early bonding opportunities.